The free stock images aren’t really free. For example, free is confined to “free for personal use.” This is great when I want to build elearning courses for my family’s safety training but pretty useless when I need to do anything work-related. 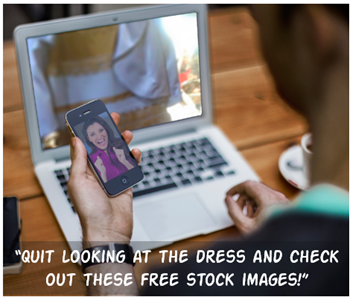 The free stock image sites are only there to point to for-pay stock image sites. You are enticed with free stock images, but when you click on the ones that look good, they turn out to be connected to a for-pay service. Most of the free stock image sites are irrelevant. You’re building courses and not the montages for Soylent Green’s Home Centers. Thus, all of those beautiful shots of nature are mostly useless. In this post, we’ll look at free stock images sire that are mostly free for commercial use. As far as relevance, I sorted them based on how I value them. Keep in mind that these types of sites are starting to gain popularity; so while some may not have a lot available right now, they will probably continue to grow and have more at a later date. They do offer commercial services, but the images are free and I love the “test drive” option they offer for each image. Here are some searches that may help for elearning: desk, business, and workspace. Desk and construction are nice collections. A great resource of old public domain images via public archives. Here’s a list of free stock image sites that require some sort of registration or are supported by commercial vendors. Pixabay: they pull in a lot of the other free sites but are sponsored by a commercial vendor. You can search by user like Unsplash and StartupStockPhotos to see a thumbnail list of what those sites have. Stock Vault: some free and sponsored images. Seems like most of these sites are basically the same. Another good reason why curating them makes sense and saves time. Morgue File: lots of free images as well as indexed commercial sites. Foter: database of a lot of free images; attribution requirements are in the image details. Keep in mind that licensing terms may change so before you use the images, double-check to make sure you can. While it’s technically not necessary to give many of the free stock image sites attribution, I think it’s still good to acknowledge them because they take the time to collect and curate the resources. Of course, attribution doesn’t work if you have to plaster links all over your course screens, but you could try one of the ideas we discussed in this post on how to use free assets in commercial projects. Obviously, there are a lot more free stock image sites. With this list I tried to focus mostly on the ones that were free for commercial use and didn’t require attribution (which bumped a lot off of the list). You can always find inexpensive stock photo subscriptions. In fact Graphic Stock (which has a good selection) regularly runs a $99/year subscription with unlimited downloads. They also have a video and audio service that is reasonably priced. This is a tremendously useful post. Great blog, Tom. It has enhanced my design and development more than I can describe. While stock photos are great for some limited use we use our own photos that we take in-house. Every time someone from out office goes to one of our sites, they take generic pictures so we can build our own library of photos. I will also work with the subject matter expert to develop a list of photos or video we need to complement elements in the topic and specifically go out and get those pictures for our development. Our people like the actual environment photos showing the topic concepts with our own staff at work in ‘real’ places. Is Tom still writing this blog? I noticed in May a change in email address (they come in as marketing now, which is what alerted me), and I notice the customary Tom name tag gone at the same time. @Robin: yes, I am still writing the blog posts. We switched from Feedburner (which Google was no longer supporting) to a new platform to distribute the weekly emails. That’s why it may show up different. Are you still able to see the posts? http://www.freepik.com/ is also good, similar to Pixabay but has a massive library of vectors and icons. Thanks Tom for the blog post. I have begun to use a few of the resources and sites you recommended and even bookmarked it for my subsequent use; it was highly useful.